Digital media, especially video assets, is critical not only to your company’s success but its survival! Videos can increase people’s understanding of your product or service by 74% versus text only.1 Three quarters of users visit the marketer’s website after viewing a video.1 Companies that don’t include digital media as a key part of their marketing strategies are being left behind and becoming less relevant. SuiteSyndicator is a state-of-the-art digital media archiving, syndication & analytics system which allows you to aggregate, syndicate and view analytics of your digital assets into one location. Easy to use, robust yet configurable, with built-in aggregate and individualized analytics, SuiteSyndicator is “Digital Media Made Easy.” After a simple upload process, digital assets are automatically converted into web-capable formats, including those for mobile devices, online sites, and Smart TV channels. Digital assets can be saved & organized by title, description, tags, meta tags, keywords, or other designators. Digital assets can be assigned to one or more categories. 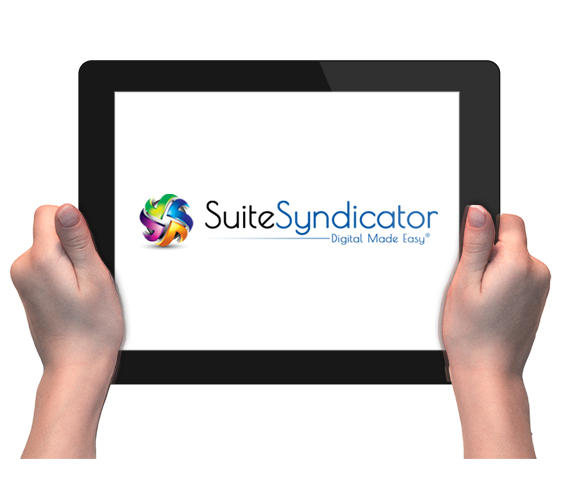 Through simple steps within SuiteSyndicator, there are administrative controls that allow for each digital asset to be approved or denied for syndication, overall or per individual syndication channel. Videos can be made public or can be assigned to editorial channels or closed groups – allowing only certain employees or department’s access. Once an asset is published it can be viewed, rated, commented or shared. Media content can be searched and found via the search function, channels, categories, tags or featured media lists. Suite Syndicator contains a pin board, known from Facebook, where latest activities will be displayed. SuiteSyndicator provides a robust analytics dashboard with the ability for aggregate or individualized digital asset or channel reporting. 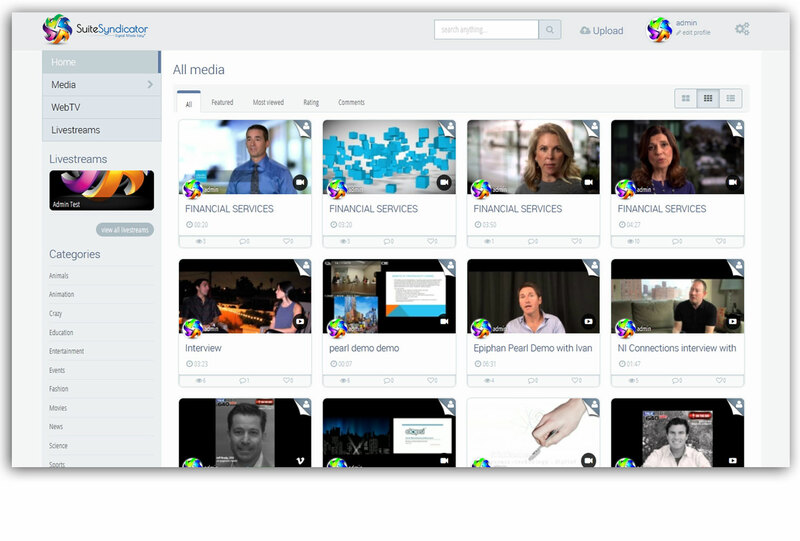 SuiteSyndicator’s Corporate Tube allows companies to upload, share, search, and watch live and on-demand videos and other media content - when they want it and where they want it. SuiteSyndicator is device-neutral and provides an unparalleled user experience as well as powerful compliance and administrative controls. 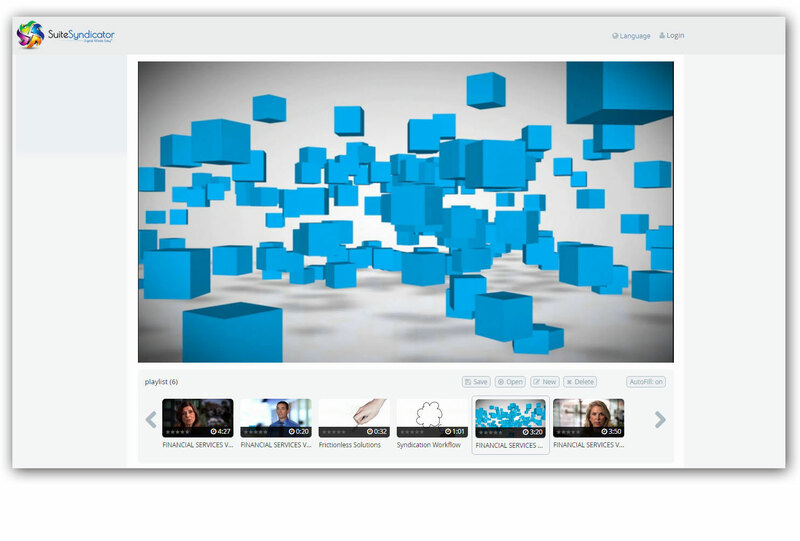 The Corporate Tube allows you to centralize your videos in a secure environment and enables Corporate Communications or IT to manage the flow of video content within the network. Syndicating or publishing your content is literally a few clicks away with SuiteSyndicator. Once you have selected your digital asset, you can select one or multiple social sites to publish your content. It’s that easy! And once your file has been published, you can click on the social media icon to view it on the actual site. All of this can be done from one centralized location – SuiteSyndicator! WebTV offers a broadcasting option for both “live” and on-demand programming. 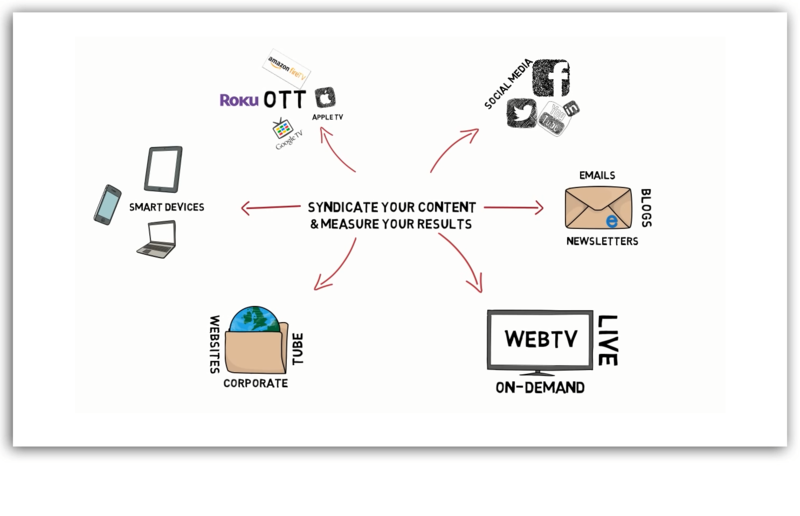 You can have defined programming for each time slot or set pre-defined playlists to “autoplay.” WebTV is device neutral so your audience can access your programming from a large TV screen, PC, laptop, tablet or smartphone. The playlist function is extremely well-suited for presentations at the POS (point of sales) or at exhibitions/congresses. You can also simultaneously broadcast live into your OTT channels (ROKU and SmartTV). Not only can you syndicate or publish your digital media assets from one centralized system, but you can measure the results and effectiveness as well. SuiteSyndicator connects you with your audience and then provides you with the most robust analytics on those touchpoints – all in one place. 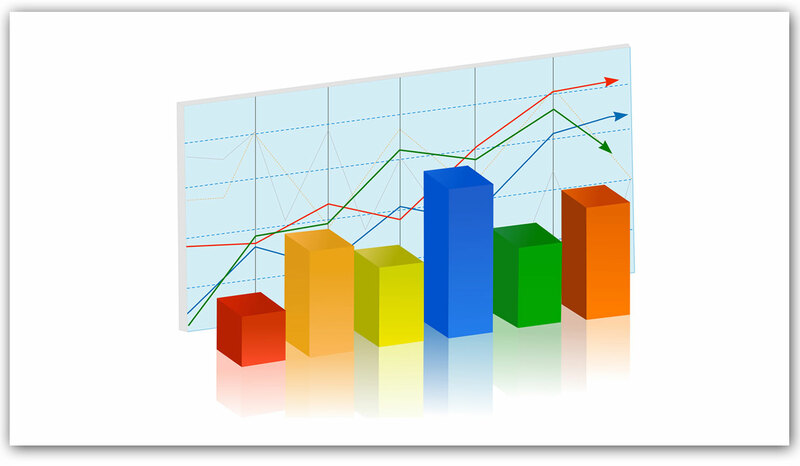 No other system provides the real-time reporting and analytics available with SuiteSyndicator.